I try to engage students with assignments designed to foster active learning. I often revise assignments. It depends on student needs and changing course content/learning outcomes. But feel free to borrow, alter, or find inspiration in these assignments for your own courses! Maybe you’ll find these useful! Who wrote/created the source? How does this influence the content/context of the document? If the author/creator is unknown, do you have any guesses (age, race/ethnicity, social class, occupation, etc.) as to the type of person who might have created it? Why? Who is the audience (both intended and, perhaps, unintended)? How might audience impact the document? What does the historical record, authorship, and audience tell us about the possible biases or problems with reliability? Are there any words or items that offer symbolism, metaphor, etc.? How does this document help you to better understand the event/person/time period? This assignment serves as practice for their final project. That assignment features examination of 7 primary sources based on their chosen topic. What would they change to improve the film/program? How much do historical films affect our ability to educate the public on history? How do we determine fact from fiction? Students should also look at professional critics’ film reviews. This will help them to craft a thoughtful review of their own. 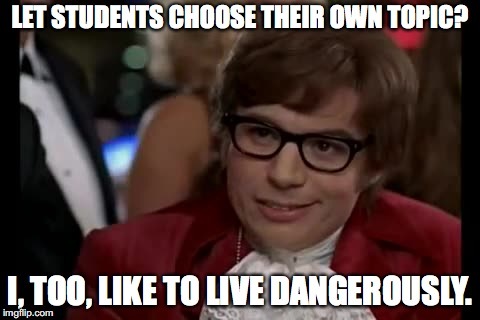 While I prefer that students craft unique final project assignments, I offer them two options. Option A is “visual” project designed for the public. Here they engage both academic and public history. I sometimes let students work in pairs. That’s done on a case-by-case basis. I also offer Option B: a traditional argumentative research paper. We do project/paper check-ins every couple of weeks. We usually start in Week 4 (for a traditional 15/16 week semester). I talked a bit about Option A in a Tedx talk I gave in 2017. You can find that post here. A key element of this project is using their sources to create a compelling public history product. These guidelines are general. They are not intended to be a one-size-fits-all. Because there can be great variation between project types. I don’t expect students to become an expert on their topic. They should present the topic material clearly. The public should be able to easily understand. This assignment is more about their ability to select a topic and research it. They need to identify, locate, and examine primary sources (a minimum of 7). Students also need scholarly secondary sources (a minimum of 4). Option A is in two parts. First is their “visual” element (Prezi, PowerPoint, Tiki-Toki, booklet, map, etc.). Second is their written element (“artist explanation”). Conclusion: what did the student learn about creating accessible history for the public? Does it differ from traditional history? If so, how? I grade projects on the following criteria. I am happy to share my rubric. Students also work with primary and secondary sources in Option B. In this option, the student writes a traditional 5-8 page academic paper on a topic of their choice. It also should relate to the course themes. A key element of this project is using both primary AND secondary sources to create a compelling historical argument. Due to the nature of this option, it does not allow for work in pairs/small groups. I grade papers on the following criteria. I am happy to share my rubric.